Today’s guest post is by my friend, Kate Cole, in England who I met doing an online course several years ago. Kate’s just published her first local history book on the town of Bishop’s Stortford in Hertfordshire. We had a virtual conversation about how she came to research and publish her book. I posed some questions, and these are Kate’s replies. I hope you enjoy reading about it as much as I have. Firstly, I would like to give my thanks to Pauleen Cass for inviting me to talk about my local history research on her blog. This is Day 4 of my week-long tour of blogs around the internet where I’m talking about various aspects of writing history to celebrate the publication of my first local history book Bishop’s Stortford Through Time. How did you start on local history? I originally started as a very traditional genealogist in the days long before the internet. By a “traditional” genealogist, I mean that I started by trying to find names and vital dates of my ancestors, and then painstakingly tracing each line back using births/deaths/marriages certificates, along with census returns and parish records. But the more genealogical research I undertook, the more I became interested in the history of the areas each ancestor lived in. Through my genealogical research into my paternal family, I very quickly discovered that I’d come from an extremely long line of Londoners from the east-end. Thus my first “local history” research projects were based around London – particularly east London history. Yes, “local history” can include London’s history! 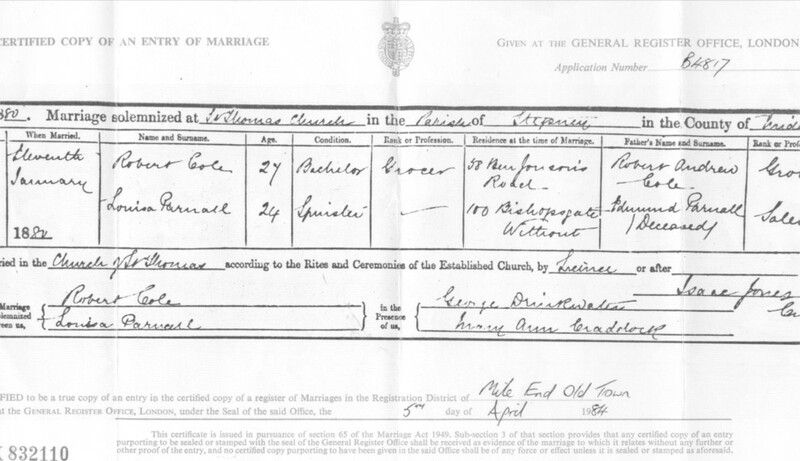 The marriage certificate of my great-grandparents – uncovering this certificate was one of my first purely genealogical pieces of research. However, the name and address of the bride has led me to 30 years historical research which has combined my own family history with local history in Wales, London and Suffolk, along with international history (the Crimean War) and even tales of Jack the Ripper’s London. How did you build up your knowledge and skills? In the early days of my research, I built up my skills and knowledge through pure leg-work of traipsing around and researching in the main London record offices and genealogical research repositories. Always reading and researching, and always trying to learn from my (many!) mistakes. Even now, after 30 years of research, I always find my first few visits to a new (to me) record office very daunting – navigating “their” systems, working out what they hold, viewing many (wrong) documents. But I also get a tremendous thrill when I’ve got the “right” primary source and I start reading a document which I know will add to my research. More recently, my chief way of building up my skills and knowledge as a historian was doing history undergraduate and then postgraduate degrees as a mature student. I signed up with the Open University just before I became pregnant with my 3rd child and there followed about 4 or 5 years of studying for my BA in history. I remember one of my second year assignments was due when my last child was about 6 weeks old. Looking after a small baby whilst writing history undergraduate essays taught me very quickly how to skim read vast quantities of historical information, whilst writing the resulting undergraduate essays in double-quick time! Whilst I don’t advocate that everyone interested in historical research (be it family or local history) should undertake a degree, for me, it was exactly the right thing to do. My degree taught me how to undertake rigorous and professional historical research, along with turning research into good-quality written output by way of essays and dissertations. Some of the 16th century primary sources I used for my masters’ degree in local history. It was extremely thrilling to work with these documents: handling them, analysing them and understanding what they could be telling me about an English 16th century rural town. In all, I studied for about 10 years as a mature student, finishing up with a master’s in local history at Cambridge University. I was working full-time in the City of London and bringing up my 3 children. Therefore, outside of my studies, I had little time for independent research projects or continuing my family history research. But, to support my studies, I read avidly all the history books I could lay my hands on for the various history modules I studied. From this, I quickly came to the conclusion that medieval and Tudor England, along with the social (home-front) and military history of the First World War, were “my” periods of interest and expertise. What’s the benefit of doing a course? One of the biggest benefits of doing my degrees was to give me self-confidence and belief in my own academic abilities. I am severely dyslexic – one of the very first children to have been diagnosed in England back in the ‘70s. But, although diagnosed, I was unsupported at school so had underachieved and left with crippling self-doubt and zero confidence. Doing my degrees in my 40s made me realise that even such an intensive academic/research based discipline as history was achievable for a severe dyslexic such as me. The confidence I gained whilst doing my academic courses was incredible. I also came to realise that, despite my dyslexia, I actually really enjoyed writing. Writing for me is often absolute agony and a very slow painful process (thank goodness for computers and spell check…) but I do find it intensely rewarding. I have love/hate relationship with writing – I’d much rather be washing the dishes then writing. But the sense of achievement when I’ve finally got my thoughts down onto paper (and corrected all the mistakes) is remarkable. Of course, the other benefits of doing courses was learning from wonderful tutors how to conduct professional rigorous historical research. The Open University is extremely rigorous in its approach to teaching mature students the discipline of history, and I learnt more about the craft of being a historian on their courses then any of the other courses I have undertaken. Although my academic days are now over (no, I’m not going to be doing a PhD! ), I still greatly enjoy courses. But now I take shorter courses and am currently working my way through some of the Guardian newspaper’s Master Classes in Writing held in London. Although very short courses (normally an intensive weekend), I find that these master-classes immensely useful and they help keep my writing on track. To carry on honing my research abilities, I use various family/local history courses – particularly the Pharos family history courses. All these non-academic courses are intensely valuable to a family or local historian as they teach new techniques and approaches, along with putting students in touch with excellent tutors – who are often absolute experts and masters of their crafts. What’s the relevance to family history? Are you interested in Family History? I am very interested in family history. During my time studying, my interest in family history had to stop. But then when I started writing my blog, Essex Voices Past, and was asked to write posts on other blogs, I’ve found myself writing a great many posts about family history. I am a great believer in the “Great Men of history” theory – that it is men (and, of course, women) who shape history. Therefore, to me, family history is a very important part within the entire discipline of “history”. People and their families are the absolute building blocks leading to our understanding of the near-past. After all, it has been feuding “families” (admittedly, dynastic families) who have caused some of the biggest battles, wars, and upsets for all our nations’ histories. Family history is a great way for people to connect with history. Very often, people who found history difficult at school (“all those dates and battles? Nah – not for me!”) don’t think that history is for them. But then they start their research into their own families and, all of a sudden, history comes to life for them. Their family’s history is their connection with the past. Also, with the centenary of the First World War, now, more than ever, has become a time to look into a family’s past. With just about every single family of all the combatant nations involved one way or another in the events of 1914-1919 (yes, I do mean 1919), “family history” has even more resonance with today’s people. What benefits are there to combining family history and local history? Whatever happened to our ancestors in the past, didn’t happen in isolation. They were a product of their time, their environment and their culture – just as today, we are products of our times. Understanding the locality where our ancestors lived and worked can help with our understanding of their past. Moreover, researching “local history” adds new dimensions, or layers of interest and understanding into “family history”. Indeed, I would argue that for anyone researching a family who lived in an industrialised/industrialising country, local history MUST be looked at to help understand a family in the context of their times. For example, in my recent book on the east Hertfordshire town of Bishop’s Stortford, I explored the town’s river, and the pioneers who made it navigable to industrial barges in the eighteenth century. This played an important part in the occupations of most of the town’s people during the eighteenth and nineteenth centuries. With a navigable river, barges were able to have access to the very heart of the town and thus move great quantities of raw goods and finished products to and from the town. Not surprisingly, nineteenth century census returns show many of the town’s population were somehow effected by the navigable river: they were maltsters, millers, brewers, publicans or working in related trades. I would also argue that “family history” research should not just include “local history” but also (inter)national history. For example, one of my main family research lines, the Parnalls of Wales/London/Suffolk, became fantastically wealthy during the Victorian age. They were merchant haberdashers and clothes-makers who had a relatively successful business from the 1830s onwards. However, their business went to new levels of success during the Crimean War (1853-1856) when they supplied uniforms to most of the British army. On another line, the Gurney’s of east and south London: my great-great grandparents went to Australia in the 1850s – where they had three children, after which they returned back to south London and went on to have another dozen or so children. Again, the Crimean War paid its part in the Gurney family history because (allegedly – I haven’t found anything concrete to substantiate it, yet!) they went to Australia to be the bricklayers on the building of Fort Denison in Sydney Harbour – a fortification built with the aim of stopping the Russian navy attacking Sydney. Understanding the times in which our ancestors lived in – in the context of local and national history – turns the raw data of our ancestors (i.e. their births, marriages, and deaths) into something much more interesting. I could recite you the bare dates of all my Cole ancestors with their vital dates all the way back to the 1760s. But far more interestingly, I could tell you that all my Cole ancestors lived, worked, married, died and were buried in east London. With the furthest Cole generation I have discovered thus far – John Cole and his wife Catherine – I can tell you he was a master cooper working in one of the earliest industrialising docks of east London, where he, his wife and children worshipped at the same parish church as Captain James Cook. I would not be able to tell you any of that information, if I hadn’t done some “local history” research in collaboration with “family history” research. The War Memorial in my home town. The First World War is one event in history when international, national, local and family history all merge together to give a multi-faceted insight into the past. How does local history help with a One Place Study? One Place Studies and Local History go hand in hand with each other. I personally find one-place studies fascinating and can give a real insight into the past. The exquisite leather-bound book containing Great Dunmow’s churchwardens’ accounts. 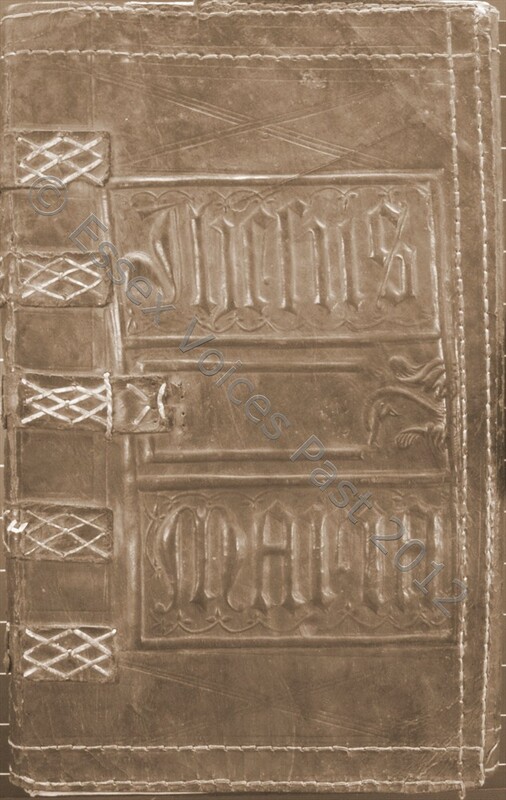 Made in the early 1500s and regularly written in until the 18th century, the book is the financial “reckonings” of an English parish church. But it can be used to answer questions about the town’s experience of Henry VIII’s English Reformation. 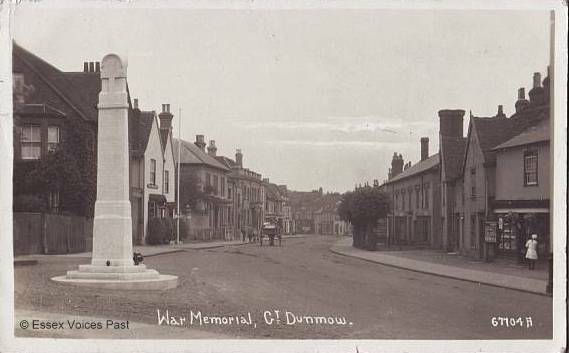 During my Cambridge University masters’ research, my major primary source was the churchwardens’ (financial) accounts of a tiny Essex town of Great Dunmow. Within these churchwardens’ accounts are the meticulous details of when the pre-Reformation parish church had raised at least 7 separate forms of “tax” on all the people in the town during the 1520s-1540s. Being ever cautious of recriminations, our Tudor ancestors had precisely itemised every single household in the town together with the amount of their compulsory “donations” to their parish church. Some of these lists of “taxes” were documented in socio-hierarchy order – so the names of the great and the good at the top, with the paupers at the bottom. Some taxes also listed street names of each house-holder. 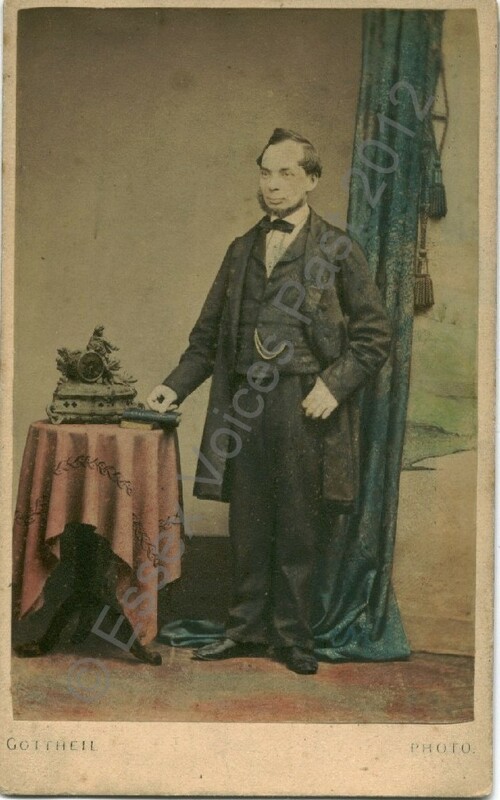 It is primary sources like this that absolutely thrill me because using them in connection with other primary sources (i.e. church records, or Henry VIII’s tax surveys), you can reconstruct a community from 500 years ago. Maybe not technically a true One Place Study – but fascinating nevertheless. I also find it fascinating that when studying just one tiny area, the same families and their names get repeated over and over again. Eventually, with good quality data, all sorts of historical questions can be asked of individual communities and societies from the past. With my Cambridge University masters’ and Great Dunmow’s churchwardens’ accounts, I was able to ask very precise questions about one East Anglian town’s experience of Henry VIII’s English Reformation and the impact his religious policies had on this tiny local community. Whilst what happened in one community can never be the entire representation of all communities, it can give great us insight into the past. Thank you, Pauleen, for asking me these questions. I’ve read Kate’s book in e-book format and I find it so interesting to hear the stories of long-distant times past, but also to see traces of the history in its current buildings and geography. It’s frustrating to think how much we destroy our heritage here in Australia, even down to the lie of the land. I also agree with Kate on the joys of churchwarden’s accounts – they can be gold mines! Thanks for sharing your story with us Kate! 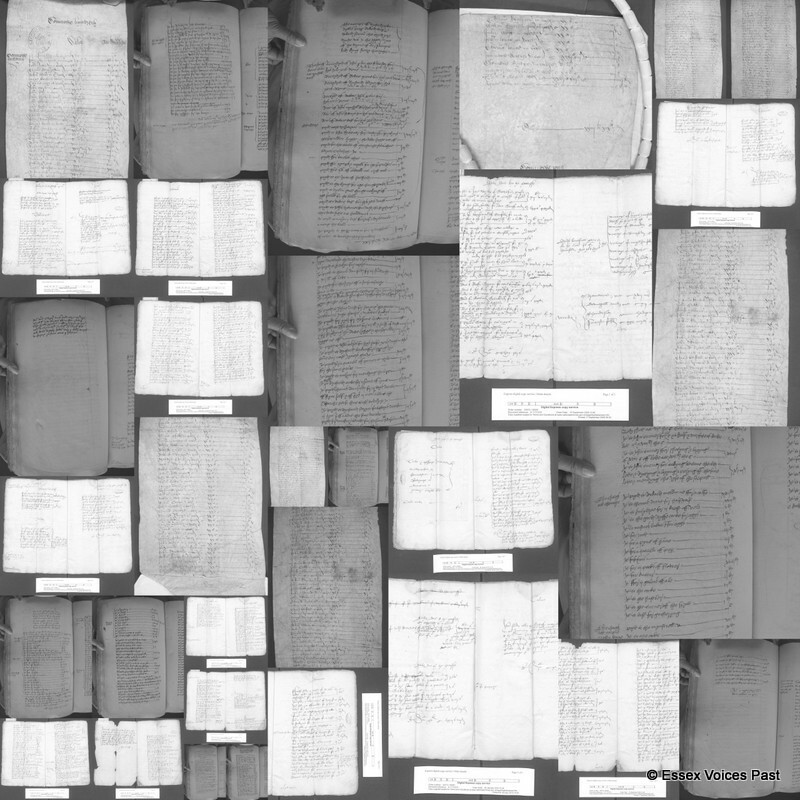 Saturday 18 October – Worldwide Genealogy Blog: The process of writing a local history book. Sunday 19 October – Essex Voices Past: Q&A session with Amberley Publishing on “how to get a publisher interested in your history book”. Monday 20 October – Ross Mountney’s Notebook: Home education and teaching history to children. Tuesday 21 October – Family History Across The Sea: Correlation between local and family history. Wednesday 22 October – Anglers Rest: Using vintage postcards to add to family and local history research. Friday 24 October – Essex Voices Past: Bishop’s Stortford’s postcards which got away. Postcards from the Front: Britain 1914-1919(due to be published summer 2016). She lives in Essex, England, and regularly write about the local history of Essex and East Anglia on her blog, Essex Voices Past. Please do click on the image below to buy her book. © Essex Voices Past 2014. This entry was posted in Books, Family History, Local History and tagged Bishop's Stortford Through Time, books, Kate Cole, local history and family history by cassmob. Bookmark the permalink. Kate has done wonders! do have a look at her other posts David, especially the Worldwide Genealogy one. I’m reminded of the song “Love and marriage” – You can’t have one without the other. Both fascinating and inspiring. Thanks Kate and Pauleen for such an informative post. I’m so impressed by what Kate has done both with study and her research so it was my privilege to have her as my guest blogger. Thanks Kerryn. Thanks Jill, I am sure others will enjoy it and a good opportunity for Kate’s book to be more widely known.